We have a large outdoor patio with a fireplace and fire pit that I've been trying to add some nice accent lighting to without spending much money. 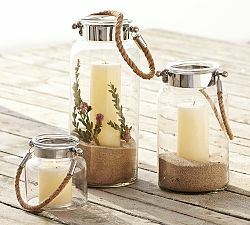 After browsing around for some ideas -- and stopping by my favorite inspiration, Pottery Barn -- I came up with the idea to use various size jars as votives. I collected a few glass jars from spaghetti sauce and peanut butter over about a week. To get the labels off I just soaked them overnight in a sink full of water. The glue was a little tough in some spots, but nothing a rough sponge or razor couldn't easily handle. The sand costs about $2 for a huge (and very heavy) bag at Walmart and the candles were $0.50 each at AC Moore. I wanted something a little taller, but to get them narrow enough to fit through the top of the jar, I was limited. Then, using a little hot glue, I simply wrapped the top with hemp rope to add a rustic feel. My husband -- who I might add has been wondering why I'm collecting all these jars -- took one look at them and said "I like it! They look very Pottery Barn." Here are a few other DIY outdoor lighting ideas that you can make on a dime. Hanging Mason Jar Votives from Home Depot: Use mason jars, wrap the top with black wire, add a candle and hang from coat hooks.